Pizza is one of my forms of kryptonite. Not crappy Domino’s pizza, but well-made, delicious pizza. Making a lower calorie pizza means you have to evaluate both the crust and the cheese. I have replaced the crust with portobello mushrooms with great success but it lacks a crunch. This time, I found a whole wheat lavash from Joseph’s Bakery in front of the deli at my Stop & Shop. Lavash is a soft, thin flatbread of Armenian origin that works perfectly as a substitute for heavier pizza crusts. It comes out a bit cracker like –but it is very tasty. I used a gorgeous fresh tomato, which you should be able to find right now instead of sauce because they are sooo good. Was I satisfied? YES! This was warm, cheesy, light and so summery (and I forgot to mention fast). Heat oven to 400 F. Spray a baking sheet with non-stick spray and lay the lavash bread flat on the tray. Add the tomato slices, sprinkle a little salt, and top with the cheese. Heat for 8 minutes unto lavash is brown and cheese is melted. Add optional slices of fresh basil. Enjoy immediately! when i have the pizza craving, for me it is usually the flavors. i love TJ's marinara sauce, adding oregano & some chili!! How is that possible in points? Each ounce of cheese is 3 pts, =6 pp w/o bread. Splain, please??? Robi, it makes 2 servings. Each only has one ounce of cheese. I believe she means 2oz of a cheese of your choice, not every cheese listed in the recipe. I am a pizza lover, partial to white pizza with spinach & onion. I like with a thin cruse or a wheat crust. Tomato gives me hives do you have a variation for white pizza? World Market (and possibly other places) sells a good whole wheat, thin pizza crust that comes in the size of a "personal" pizza. I like using it because it lets me focus on putting calories into my toppings instead of crust! Also, anything that gets me to eat a reasonable portion of pizza, instead of ordering a much bigger one for delivery, is a good thing. Spread our zero fat Roasted Red Pepper hommus on the pita as a sauce instead of no sauce. Even better! I have a seven year old boy, safe to say pizza is a regular in my house. I make toaster oven pizzas out of pita bread. One whole grain pita, about a tablespoon of sauce, sprinkle of cheese and whatever veggies are on hand. Baking in the toaster oven means you can keep them kind of chewy or make them crunchy according to preference. Check out Mama Mary's thin whole wheat crust from grocery store--large family size or personal size (3 to package). And get creative with your toppings--our favorite from a pizzeria in San Diego includes black olives, mushrooms, artichoke hearts and clams! OK, it is 12:00 noon where I am. I just read this recipe and now am soooooo hungry! Just a guess, but I don't think Domino's will appreciate being called "crappy"
Thanks, Lisa. These look yummy. FYI, I've combined your mushroom pizzas with your egg cups. I put a touch of sauce in the big mushroom cap along with a raw egg - bake 20-25 minutes. Very good. Sometimes use cheese, sometimes not. Thanks for your great ideas and inspiration. No mozzarella cheese, no pepperoni, no pizza crust. 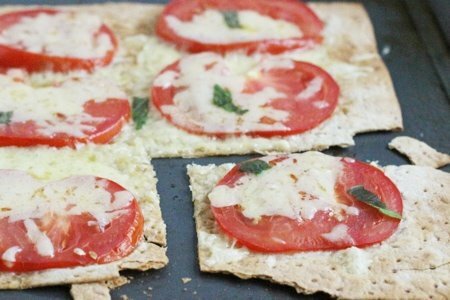 I love this idea, but you can also use a lot of other flat breads. I make our pizza crust and it is really healthy and easy to make. Look up "no knead pizza crust". The gluten is almost completely broken down making it easier to digest. Just mix the water, flour and yeast together well, put it in a bowl and leave it overnight. This way you don't have to knead the dough. Time and yeast will proof the dough. It can proof for up to 24 hours. I usually use mine in 14 hours. It is so light and airy. You can bake it as bread or flatten for pizza. Bake in a really hot oven and you will have true pizza that no takeout can rival. Believe me, it is the best you will ever have. I've yet to try Lavash but it's definitely on my list. Please check out my blog for some healthy snack recipes. I'm loving all of yours! @ Yi - Hi Yi, I visited your blog and found some good ideas and recipes. We don't eat fat free foods anymore. We found foods with fat are more satisfying and healthier. Processes to make fat free foods are not healthy and many people don't use soy anymore. For those who want to see the recipes click on "Yi" under Yi's post. I love that you share WW points+ values. I do this one my own blog as well! therightmeal.blogspot.com. YUM! I find myself have pizza cravings a lot and I feel like these guys would curb the cravings and keep the guilt at bay!